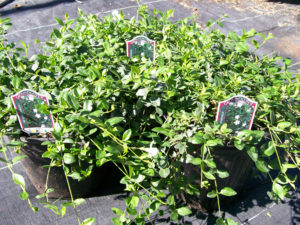 In this blog I feel like selling some Vinca minor (myrtle, periwinkle) before we dump it. 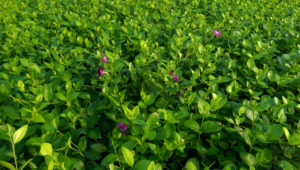 In past years we had a mass-merchant account that did not suffer from good taste and so they wanted a wide variety of vinca minors on the theory that more variety would sell more, a theory that works well for breakfast cereals. And so we grew for them the following: a white one called ‘Emily Joy’ and a reddish-purple one called ‘Atropurpurea’ and a dwarf white one called ‘Miss Jekylls’. And that is why we have too much of them sitting around in the way. The real reason we have too many of them sitting around is that some of the mass-merchants dumped us and we dumped some of them and by now we are confused but at least we do not have any more mass-merchant accounts. I am not tough enough for that. These vincas would have been dumped already but we are using our skilled crew to make pachysandra ‘Green Carpet’, some 4.2 million cuttings worth, this time of the year. I think it will be towards the end of November before we can spare the crew to dump stuff. These are in small plastic pots of one kind or the other and sometimes we have bulb crates full of clumps and you can call for pricing and availability. Be ready to bring a large truck if you want some. The ‘Miss Jekylls’ variety is interesting and greatly under-utilized in the landscape business and the reason is because it has a habit much different from the usual Vinca minors. It acts more like a thymus or maybe a mazus or even a sedum in that it has a very small leaf and a very weak stem. It flows around rocks and hangs over the edges of things and has a very fine texture, or did I say that already. Also, small white blooms. We think that someone named Gertrude developed it over in England. We are continuing to offer three varieties of Vinca minor—the old standard ‘Bowles’ and the very similar ‘Dart’s Blue’ and the nice variegated one ‘Ralph Shugert’. Sales for Ralph Shugert have dropped and so we have even more than usual sitting around. It is nice and never reverts. It is a selection from Hortech. I found the ‘Dart’s Blue’ strain over in Holland at the famous Darthuizer Nursery. It looks a lot like Bowles. When we first brought it over and planted it in the field we could see a slight difference in texture between it and Bowles. Otherwise, it looks the same. We are growing these two vincas at two different locations to minimize human error from creeping in. 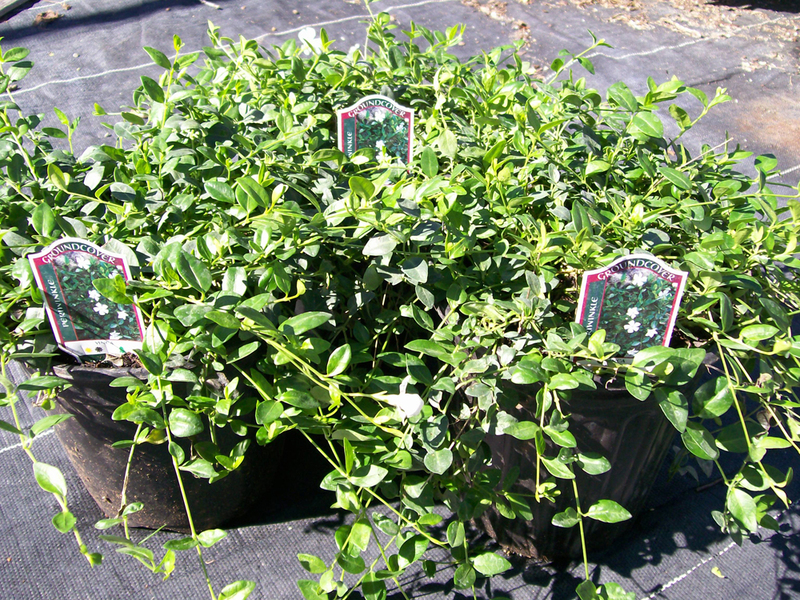 For years we could not grow enough vinca minor to satisfy the market and we tried all kinds of methods of propagation and field growing and cuttings and divisions and then battled black stem rot. Now that the market is pretty well saturated we have discovered the perfect way to propagate it and the way to rejuvenate it from a mature bed because it only propagates from stem cuttings when in the juvenile stage. I learned that method from Frazer Hancock’s grandfather at an early International Plant Propagator’s Society meeting up in Canada. And because I am a member of IPPS I will share all of the secrets with a fellow society member and not with just any old normal person. We can produce this plant in about any size pak or container. Right now we start it in a 105 cell pak tray (10-20) and grow it in every incremental size on up to a one gallon pot. 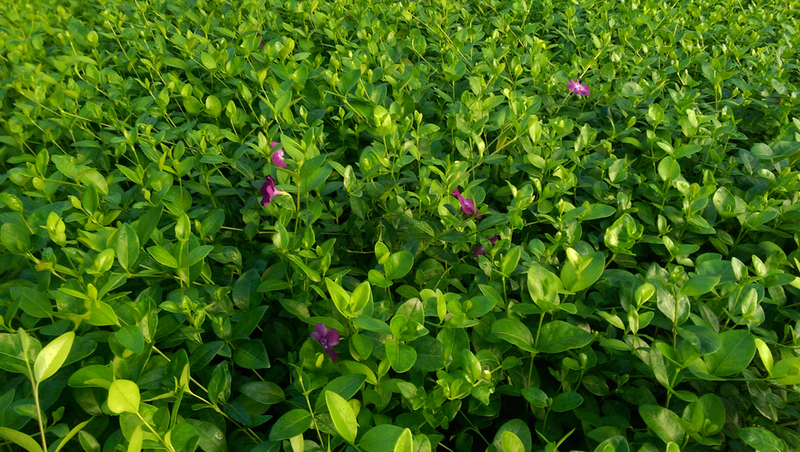 Vinca is nearly the ideal groundcover as it is ever-green, spreads by runners and by rooting down by roots developing from every node, and it grows in the shade. There is a dark blue bloom for a few weeks in the spring. It usually grows thick enough to choke out all weeds. We get a little bed straw (the wild version of Galium odorata) growing up in a mature bed, but this is easily pulled and discouraged. I am very proud of having developed the perfect propagation method except that I wish I had discovered it back when we could have made a lot of money with that knowledge. We are now looking for the next ideal groundcover and I think that it will be Bearberry, Arctostaphylos uva-ursi ‘Massachusetts’ strain. I now have that propagation technique developed to a dependable degree and now we are going to over-produce it greatly because that is what groundcover people do. We cannot help ourselves and we have, so far, not made enough money to be able to seek therapy.